Camden wouldn’t touch the bike parking tax with a bargepole, would they? Last week, we heard that Camden Borough Council were also thinking about stealth taxing motorcyclists to park in their borough. We say “also” because it sounds like Camden are desparate to copy the scheme introduced by Westminster Councillor Danny Chalkley, a scheme that 100% relies on the pay-by-phone parking technology which, when use as a sole and unique practical method for payment, is socially exclusive. Camden Borough Council is a member of the Westminster lead Partnerships in Parking consortium (PiP), for which the implementation and running are currently under investigation by the European Commissioners for potential serious breach of European Union law. 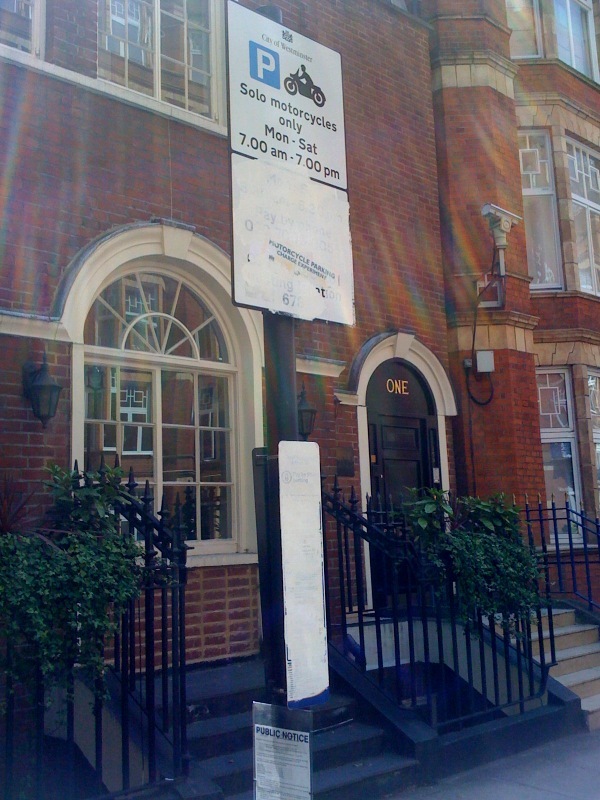 Camden have advised that they will start to trial the pay-by-phone parking technology between January and March 2010. But will they be doing this through the potentially illegal PiP scheme, whereby they will be trialling the rubbish Verrus pay-by-phone parking system already implemented in Westminster and under investigation by the European Commission, or will they be going their own way to conduct their trial? We have actually found out that Camden are silly enough to even consider pay & display tickets for motorcycle parking, as a proof of payment. As if pay & display tickets for motorcycles had not already been trialled by other councils throughout the United Kingdom and proved totally useless and unpractical, as they fly away with the wind, get wet in the rain and are subject to theft. Even Westminster Councillor Danny Chalkley had proved to be a little bit more intelligent by not even trying to charge bikes for parking with this method. Anyway, we seriously think that Camden Council have absolutely no idea of what’s coming their way, should they even pronounce the words “charging motorcyclists for parking” in their borough, whatever the method(s) they use. Bikers in support of the No To Bike Parking Tax campaign are most likely prepared to request copies of Camden’s accounts, affairs, documents, policies etc (via Freedom of Information requests) to scrutinise them in deep detail and report anything found wrong in them to the relevant authorities for investigation. That’s exactly what has been done in the case of Westminster City Council, for which their parking strategy and their PiP scheme are now being investigated by the European Commission and a public inquiry made to the Department of Communities & Local Government (DCLG), as a result of Councillor Danny Chalkley imposing an unwanted parking tax on motorcyclists. Not to mention the hundreds of Freedom of Information requests that will be submitted to Camden Council, in exactly the same way as to Westminster Council, which have obliged them to recruit additional staff to cope with the enormous volume of work. Camden will also see thousands of angry bikers demonstrating in their streets and at their doorstep every three to four weeks. And some guys (independent from the No To Bike Parking Tax campaign) might dress up as Blanche Neige and deface the Camden bike parking signs, in the same way as they did in Westminster, costing them circa £220,000 to clean or replace! Defaced bike parking sign in Westminster. Do Camden really want the same? And let’s not forget the thousands of emails, letters and objections that Westminster City Council have received over the past 16 months, which Camden will see coming their way too. Do Camden Council really want to go through the same nightmare as Westminster City Council? Bikers are now very experienced at protecting their rights and freedom, any council trying to bring in a parking stealth tax to fill up their coffers will, without a doubt, see the No To Bike Parking Tax campaign coming their way, like a tropical storm with black and thick clouds can cover a whole area in a few minutes and bring in a deluge of rain with it. The question is whether Camden Council are really prepared to embark on to a very big and painful battle against thousands of strong, determined and experienced bikers, who will fight them until the very last minute. 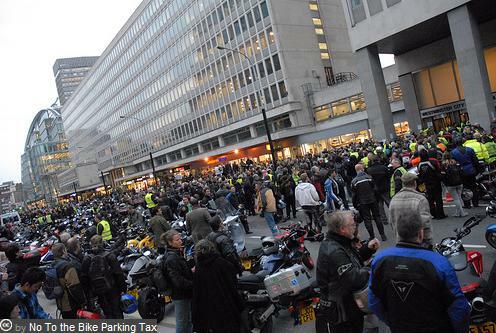 Bikers will never give up, they will not go away until they are guaranteed permanent free parking. Best of luck, Camden, that’s all we can say to you! We now leave you with a few quotes from Camden officers, which clearly demonstrate that they have absolutely no idea of what’s coming their way, should they dare to charge bikers for parking. “I can confirm that Camden will be looking into charging motorcyclists to park in motorcycle parking bays. We will be looking into implementing this in the next financial year” (Syed (Engineering) Hussain, Senior Engineer, Camden Borough Council). “I expect that we could be investigating motorcycle charging towards the end of 2010/11, but we cannot commit to implementing any bays in 2009/10” (Roy Turner, Principal Transport Planner, Camden Borough Council). “The short answer is that we intend to look at the whole issue at some point next year, workloads allowing” (Sam Monck, Head of Street Planning, Camden Borough Council). And what about the R.A.T.S? Surely they will pay a visit to Camden too! Yep, let’s start the fight in Camden right now, before they even get to the consultation stage. This council is acting like headless chickens. Surely the poeple of Camden and Londoners would not allow the bike tax to be introduced, would they ? Well we have evidence now that this will spread if we don’t fight it so lets get the Camden campaign started sooner rather than later.